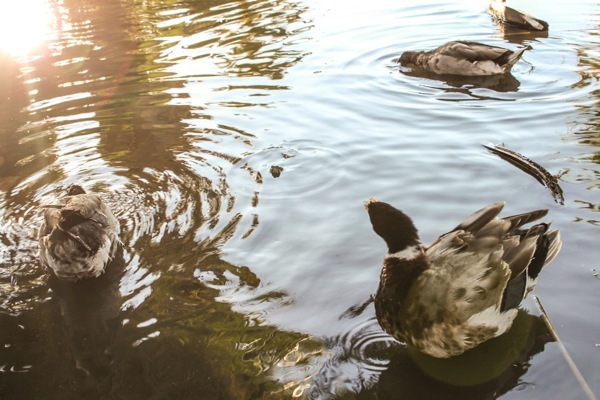 Along with it: picnics, hikes (without being chilly! ), wine on the balcony, dresses… I’m so excited I can hardly stand it. I’m also excited for another month to start fresh, kill it in the gym and build on from my Winter Shape Up results- hope you feel the same way! If you’re feeling a little blah or unmotivated lately, I feel ya. It’s really easy to get into a spring slump, and just remember that yesterday doesn’t matter: today and right now are all that counts. Do what you can and take good care of yourself, mm k? 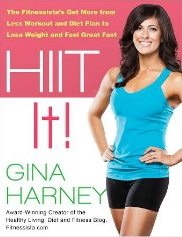 All about HIIT <– plus my favorite techniques! I’ll also be posting NEW workouts on the days according to this schedule so you can add them into your rotation if you’d like. (For example, if I’m going to post a booty burner, it will be on a Thursday.) 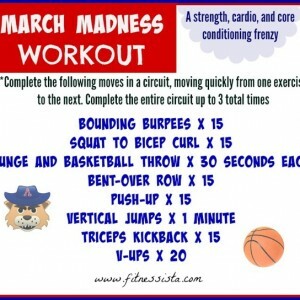 Also, stay tuned for the March Madness workout! What are you going to make happen in March? I’d love to hear at least one goal that you’ve set! New post on the Fashion page! It’s not helping my desire to chop off my hair. Thanks for posting this…definitely feeling a slump but I want to keep the motivation going from WSU! Bring on March Madness! Thanks for all the workout options! I sometimes get into a little rut throughout the weekend when I don’t have everything totally planned out! Oh, this is so exciting, because I just made myself a training schedule that aligns really nicely with this plan! I am just going to sub a tempo run for the tuesday HIIT!!! So excited for some nice targeted Upper/lower workouts! 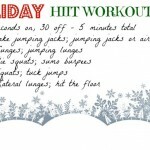 I LOVE the Santabata Workout! I do this one a lot in the park on my runs. 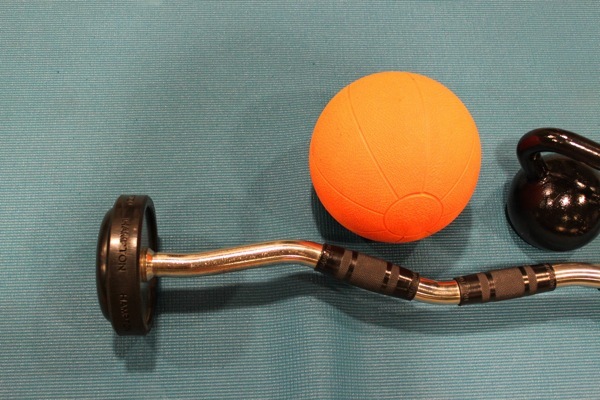 I will include a bedtime Ab Burner from now on, such a great idea! Thanks for the plan! I’m gonna have to adjust it a little to fit my schedule but i’m looking forward to try some of your workouts that are new to me! what does ‘steady state’ mean? I’m excited to have a plan to keep me on track! This is great, Gina! Thanks for the workout examples too! I can’t wait to try some of them! Happy Saturday! My goal for March is to start getting up early and going for a run or do some weights. I was doing the morning thang for awhile but got lazy when we had blizzards and I didn’t want to deal with the snow. Now that it’s light out earlier in the morning and the snow is mostly gone, I want to get back to it! I don’t generally work out at home because I’m just not disciplined enough. I’ve been really slacking lately so my goal is to make it to the gym at least 4-5 times a week. This morning I did Zumba and Strong (strength training). It felt great! PS – what kind of shoes are you wearing in the pic? I need a new pair and I really like them. Thanks! they’re nike free runs- love them! Love this! Thanks, Gina! I haven’t done an upper/lower body split in a long time so this is perfect timing for me. 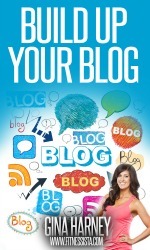 I’m excited to follow along and psyched for the workouts you’ll post! Awesome. 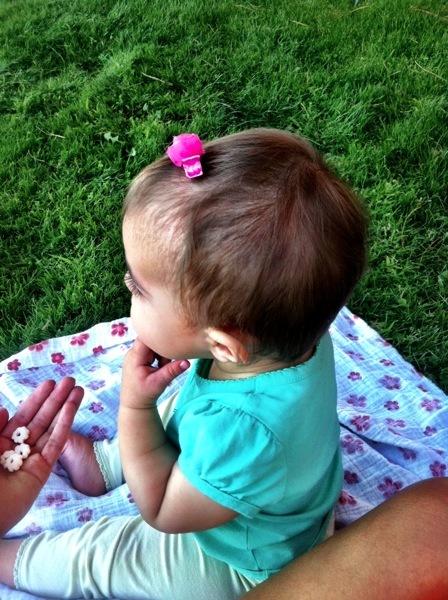 Gina, have you seen Guiliania Rancic’s new shorter hair? L.o.v.e it! I bet that would look good on you as well. Have a great weekend. My March goal is a 30 day no sweets challenge. On day 3 now so I can be done before Easter! 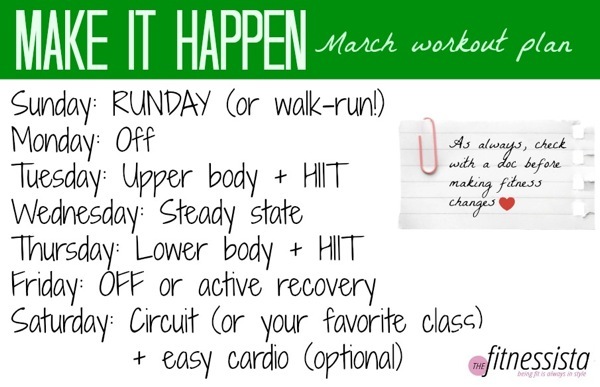 Make it Happen March-go to boot camp 3x a week! Oh and I accept the March Green challenge. Had zucchini yesterday and enjoyed a post run green smoothie today! My goal for March is to make every minute count – in workouts, family life, with friends, even house work! I am SO GLAD you did this!!! 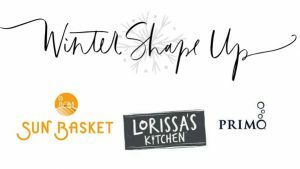 I was just a tad lost after feeling so into the winter shape up and seeing results, and then having my schedule all up to me! I want to keep seeing results. I’ve been doing weights for months and haven’t gotten this much stronger until your program!! Thanks for the great ideas. I’m excited for March because that means tank top weather! Woot! It’s 35 degrees where I am, so I can’t wait for springtime! I have noticed I am a ton stronger than I used to be…but I’m still not SEEING the muscle definition. It’s kind of annoying, because I can pump out much higher weights and reps but I’m just not seeing the results. So my goal for March is to focus more on target areas-having specific days for arms and legs will help! Whenever I do weights, I tend to just do full body circuits. Thanks for posting this! i just found your website a month ago and have enjoyed all the workouts! 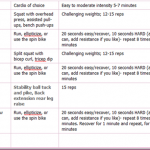 I was wondering what do you mean by “steady state” on the workout example above? 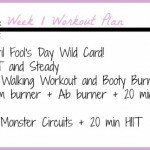 I am headed to the gym on Monday to put together our March plan!! Oh I like this a lot! I’m trying to keep weight training incorporated in my training schedule while I get ready for a full triathlon season (one a month starting in May!). I think the template you posted here will work very nicely for me. My #makeithappenmarch is to switch up my eating habits. I was trying a strict paleo approach for the past couple months but I don’t think it’s for me. And I miss greek yogurt a little too much, haha. I’m now aiming for emphasizing clean eats and whole foods but without eliminating whole food groups. Thank you for this! I am definitely feeling a little bit of a slump after WSU, so this will hopefully be good motivation. My make it happen March goals are to continue working out consistently and emphasize (mostly) clean eats a little more. In the past couple of weeks sugar has made a bigger appearance, so I am going to work for a little more moderation in that area. On another note, I am looking to check off some wedding related to-dos this month! I absolutely HATE the pop up ads from the bottom of your pages! Make them STOP! Seriously, if you want readers, these ads are too annoying to continue. I’m going to make it happen in March! I have to stand in a wedding at the end of the month, so there is a lot of motivation for me. Can’t wait to share pics and such on IG also! Gina, THANK YOU so much for posting this from the bottom of my heart!! 😀 I’ve had a sinus infection for 2 weeks so I’m just now getting back to the gym and I have DEFINITELY hit spring slump thanks to that. 🙁 I was just thinking after my workout today, I really need some new stuff to mix it up and keep it exciting- have I mentioned lately how AWESOME you are? My ankle has let me know loud & clear that it’s not ready for me to run or even start trying to build up mileage. So March I am going to take up riding a bicycle for cardio. My goal is to ride bike 12 days in March. 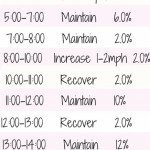 After WSU, I switched to the workout plan in my Super Fit Mama book by Tracey Mallet. I think I’m going to continue with that plan for a bit and throw in some if your burner workouts to shake things up. 🙂 I loved the motivation of WSU, so I’m excited to have new hash tags to use! Seeing how my body is shaping up 3 months post partum (and seeing still how much further I have to go) is motivating too! Love that you posted this plan. I have definitely hit a slump this week and was not excited about my workouts, but I think this will help a lot with my focus! Thank you!!! 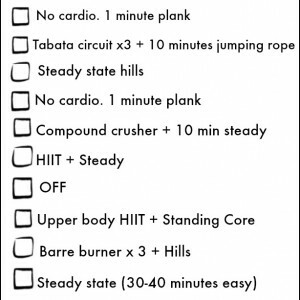 I love circuit workouts, they are always the most challenging but have the most variety. Gina you look amazing! I am so inspired by your dedication and workout plans. I am a graduate student and I am struggling to find the time and motivation to get back into a routine, but this and the winter shape up has definitely helped! Thank you for sharing. My goal this month is to stick to a 5K training plan for a 5K I am doing in mid April. I’m gonna check out your ab burner! The one thing I neglect continuously! I wish spring was in the air here..it’s still so cold! achh! I am about 13 weeks pregnant and hoping that my morning/all day sickness is going to get better so I can start moving again. 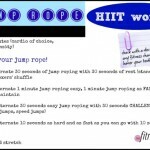 I think this plan is a great way to get started, but I don’t think I can do the HIIT workouts regularly. Do you have any good substitutions? I’ve been following along this week, but forgetting to comment. I did my lower body + hiit on monday, run day on Tuesday, and upper body + hiit today. Decline push-ups were the challenge for this weak armed gal = success. Thanks for providing the plan to follow!